Preheat the oven to 400 F (200 C) and place peppers over an oven tray with baking paper. Roast them for an hour or till they turn partly light brown (see the picture). 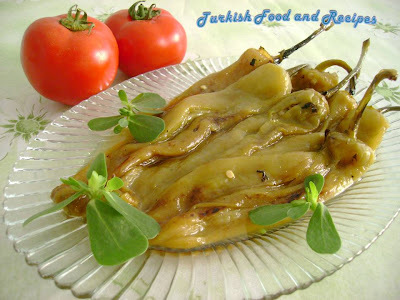 You can also roast peppers over a grill/barbecue. Take out and let them cool down. Then peel and make a cut in the middle lengthwise with a knife (see the picture). In a bowl, combine vinegar, olive oil/canola oil and salt. Stir in roasted peppers, parsley (optional) and mix them all. Cover and leave in the fridge for about 2-3 hours. Then, place the peppers over a serving plate and serve Roasted Pepper Salad with any kind of dish. Firini onceden 200 C (400 F)’ye isitin. Yagli kagit koydugunuz firin tepsisine biberleri dizin ve yaklasik bir saat boyunca ya da biberler hafifce kozlenene dek pisirin (resime bakiniz). Ayrica, mangal/izgara ve kor uzerinde de kozleme islemini yapabilirsiniz. Kozlediginiz biberleri sogumaya birakin. Sonra, kabuklarini soyun (resime bakiniz) ve uzunlamasina ortasindan bicak ile bir kesik yapin (Fakat ikiye bolmeyin). Bir kasede, sirke, zeytinyagi/sivi yag ve tuzu guzelce karistirin. Kozlenmis biberleri ve maydanozu (istege bagli) ilave edin ve harmanlayip karistirin. Uzerini kapatarak bozdolabinda yaklasik 2-3 saat kadar dinlendirin. Sonra, kozlenmis biberleri servis tabagina alin. Kozlenmis Biber Salatasi’ni her turlu yemek cesidi ile birlikte servis yapabilirsiniz. 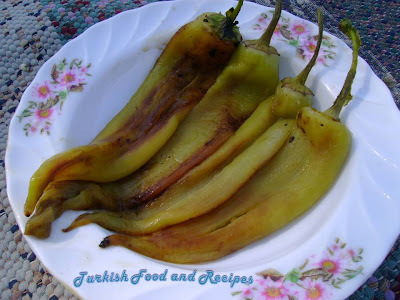 I have used this recipe this morning, my husband picked many banana pepper from the yard and at first I wasn't sure what to do with them. This is a percise and delicious recipe. Thank you! I feel like this is going to be the fate of all the banana peppers this season :) p.s. I also made one of the breakfast recipes this morning. delisious!! !